When I heard that today was World Down Syndrome Day, Michael came immediately to mind. When I was a pastor, there was a young man in my parish (pictured above with me) who served Mass each Sunday. Michael is really something else. Besides being a great Altar Server, Michael is a joyful and responsible young man. He is an inspiration to so many people and, wherever he goes, Michael brings joy with him. A few years ago, the parish honored Michael for all of his accomplishments. Everyone who was in the room that night was moved to tears. We all had a sense that this is what a parish is all about. Because he has difficulty swallowing the host, Michael once asked me, "Can I take the wine?" I cocked my head and with a smile said, "Is it wine?" Michael smiled too and said, "No. It's the Blood of Christ." Each week, it was my privilege and joy to share the chalice with Michael. 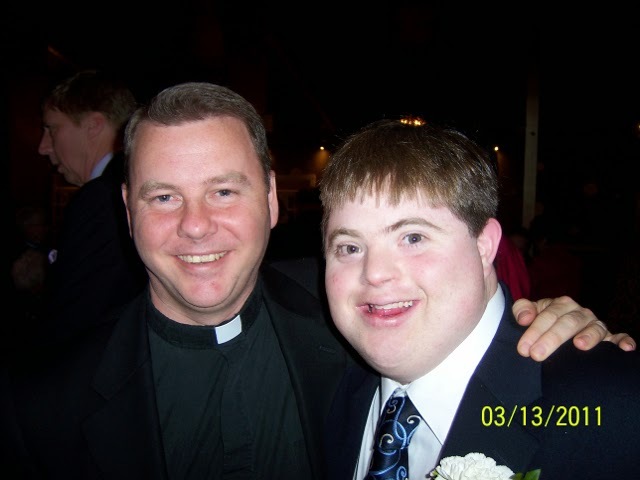 It is such a great honor as a priest to meet and to know people as loving and joyful as Michael. Evangelization is about witnessing to the power of Jesus Christ. Michael is such a witness to me and to many others. I'm often asked what do I most enjoy about being a priest. There are many answers to that question. But, as they say, a picture is worth a thousand words.